Many of you know I am an active user of the Foursquare app and have been since shortly after its launch. It’s a great way to keep up with friends and their hang outs, learn about new places via the Explore function, as well as discover the best reasons to visit those locations thanks to informative user Tips. Having over 2,500 check-ins myself, I’ve been known to add a few tips. Lots of them. Everything from current, seasonal tap beer selections, to “the place makes their own kettle potato chips” and everything in between. All along, I have added these tips to keep future customers informed, as well as promote some of the great things the locations were doing to stand out from the competition. By default, it’s also a fast track for customers looking for information not readily available via a company website. Lately, I’m seeing more of those tips in action. With progressive frequency, I’m having more and more people “Like” my tips. 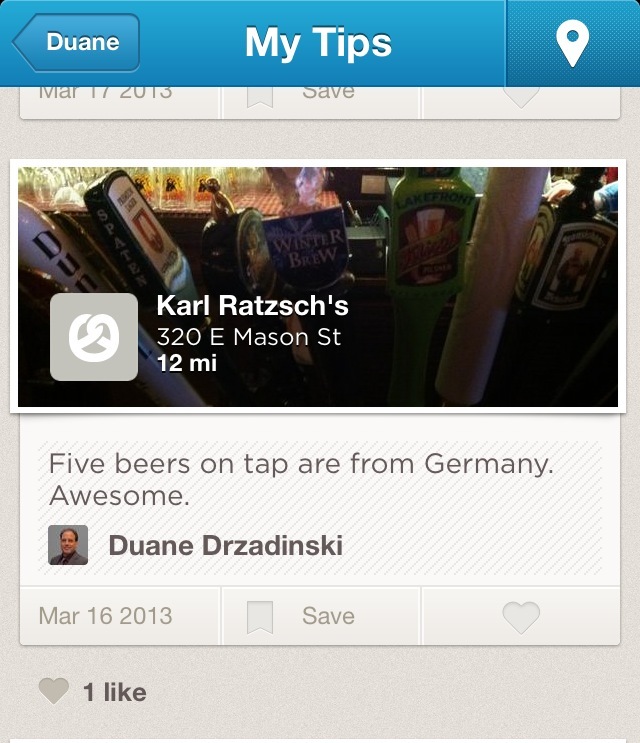 Users simply tap the heart icon, and the app alerts me they took my tip to heart (yes, pun intended). It’s almost like they found a valuable coin I left behind (in an envelope with their name on it), and knew how to get in touch with me to say thanks. What a great way to find out your input mattered to someone! What’s your business doing to become “tip” worthy? Are you asking your customers for their feedback via comment cards, or are you asking them to use the new technologies for both of your advantages?